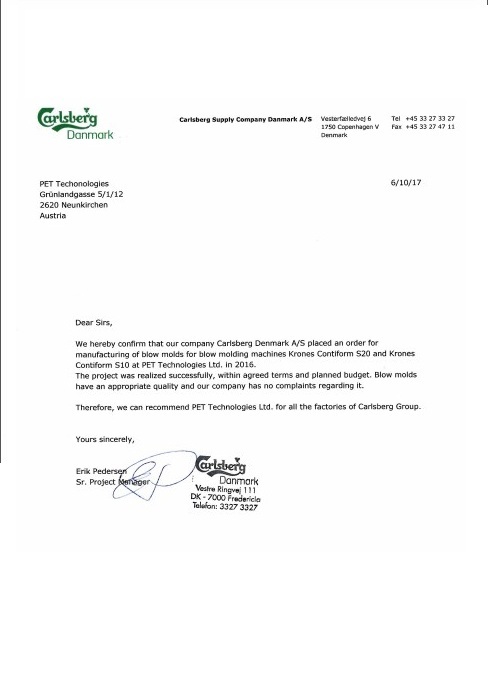 We hereby confirm that our company Carlsberg Denmark A/S placed an order for manufacturing of blow molds for blow molding machines Krones Contiform S20 and Krones Contiform S10 at PET Technologies Ltd. in 2016. The project was realized successfully, within agreed terms and planned budget. Blow molds have an appropriate quality and our company has no complaints regarding it. Therefore, we can recommend PET Technologies Ltd. for all the factories of Carlsberg Group. 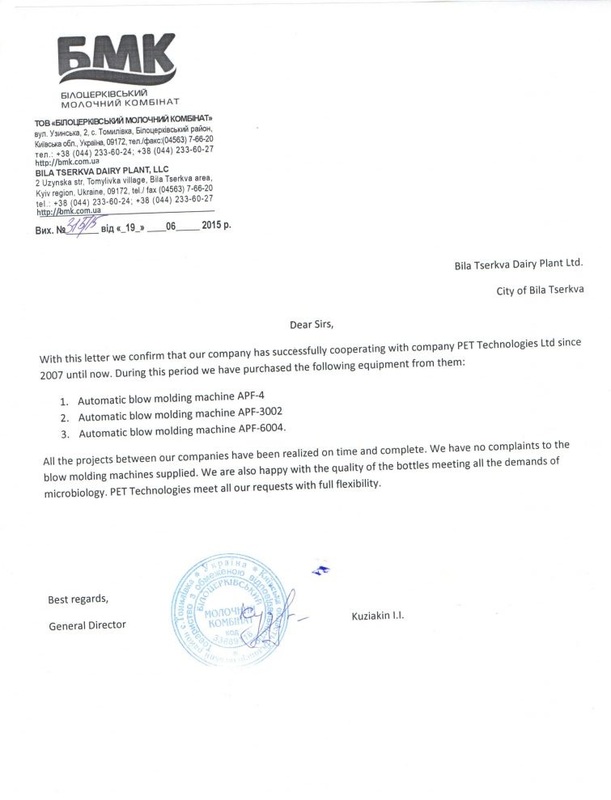 We hereby inform that since 2009 our company has been working with PET Technologies, the producer of blow molding equipment for PET bottles production. 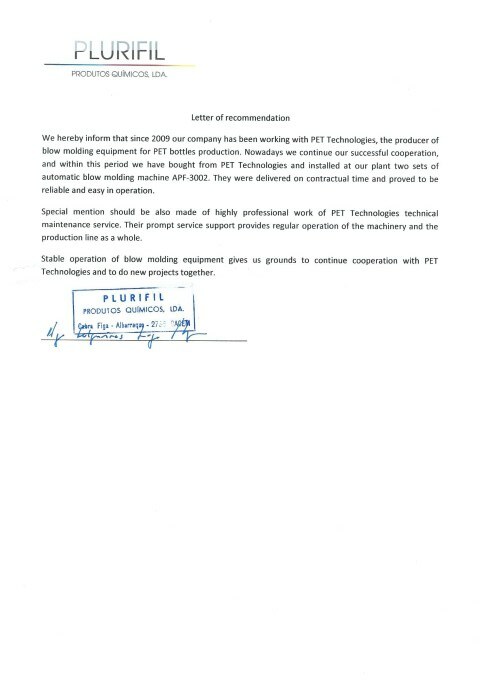 Nowadays we continue our successful cooperation, and within this period we have bought from PET Technologies and installed at our plant two sets of automatic blow molding machine APF-3002. Thet were delivered on contractual time and proved to be reliable and easy in operation. Stable operation of blow molding equipment gives us grounds to continoe cooperation with PET Technologies and to do new projects together. Triumbari Corporation has been collaborating with PET Technologies since 2016. Their machinery has supported the growth and development of our business. 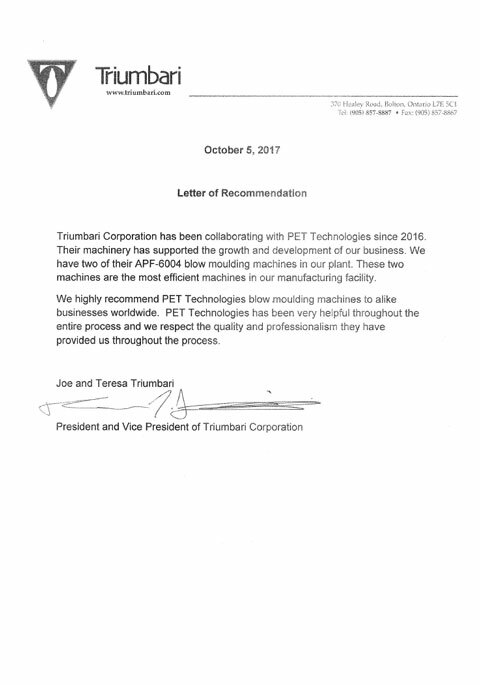 We have two of their APF-6004 blow moulding machines on our plant. These two machines are the most efficient machines in our manufacturing facility. We highly recommend PET Technologies blow moulding machines to alike business worldwide. PET Technologies has been very helpful throughout the entire process and we respect the quality and professionalism they have provided us throughout the process. “The Petainer Group has been working alongside PET Technologies since 2014. 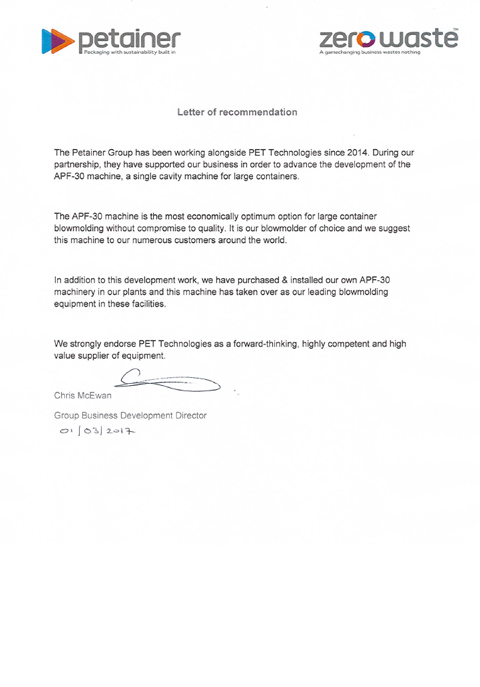 During our partnership, they have supported our business in order to advance the development of the APF-30 machine, a single cavity machine for large containers. 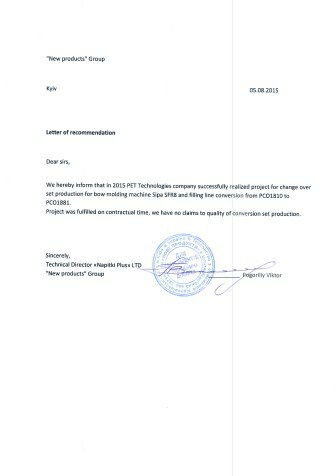 We hereby inform that in 2015 PET Technologies company successfully realized project for change over set production for blow molding machine Sipa SFR8 and filling line conversion from PCO1810 to PCO1881. Project was fulfilled on contractual time, we have no claims to quality of conversion set production. 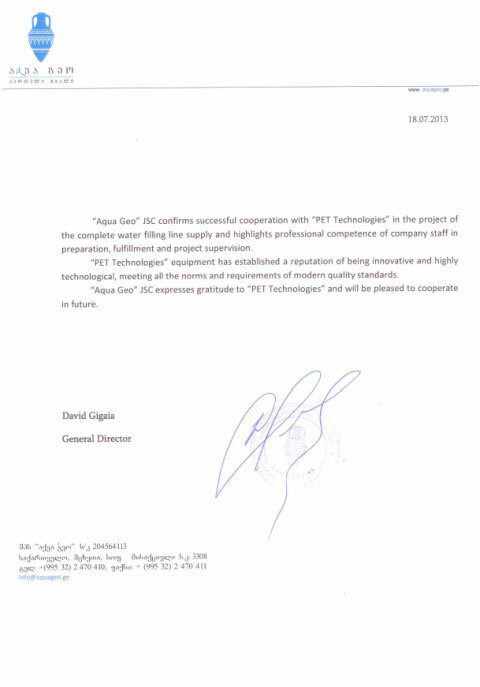 “Aqua Geo” JSC confirms successful cooperation with “PET Technologies” in the project of the complete water filling line supply and hightlights professional competence of company staff in preparation, fulfillment and project supervision. “PET Technologies” equipment has established a reputation of being innovative and highly technological, meeting all the norms and requirements of modern quality standards. “Aqua Geo” JSC expresses gratitude to “PET Technologies” and will be pleased to cooperate in future. All the projects between our companies have been realized on tie and complete. We have no complaints to the blow molding machine supplied. We are also happy with the quality of the bottles meeting all the demands of microbiology. PET Technologies meet all our requests with full flexibility.